How to find YouTube Video Ideas or Vlog Topics. 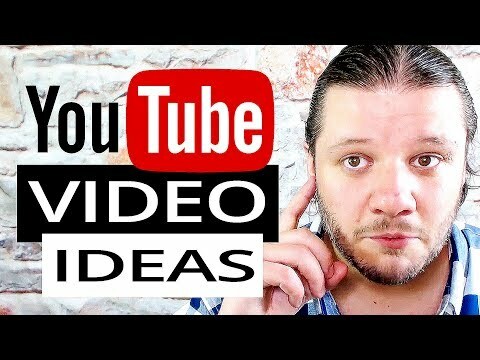 Finding new ideas for YouTube Video Topics can be hard at times but I have 3 Tips On How To Find Video Topics which will give you Unlimited YouTube Video Ideas & YouTube Video Topic Ideas so you never have to worry again. Writing block is common in most creative fields and ideas for YouTube videos can be hard for new YouTubers to come by when you can’t see the wood from the trees. That is why I have a method to discover my YouTube Video Ideas and topics. Pull from your own personal experiences. Your life can be a very deep well of information, opinions, hobbies and content ideas. I know sometime it can feel like you have nothing to think about but why not look at your hobbies and explain that to your audience. Are you a video gamer? Why not tell us about your favourite game! Do you like fashion or makeup? Why not make a video about your new summer look, your favorite make up and how you put it on. Or talk more personal, tell us about your family, your friends, your day at school. You can always find something to talk about in your personal life. Trending topics can be the source for UNLIMITED YouTube Video Ideas in its own right. Trending topics can be anything that is in the news right now. Why not react to the news, a new music album, a theatre play or the latest new toy trends like Fidget Spinners. Trends can also pop up out of nowhere like the ALS Ice Bucket Challenge did in 2015 or the Harlem Shake. To find trends just watch what other large YouTubers seem to be doing and make a video about it, react to it, talk about it or watch that tv show or movie. Sometimes it can be very tempting to make a 15 minute video about a topic in depth. I have done it myself with a couple videos about Music Festivals. These videos are 10-15 minutes long and have 10-30 tips on how to survive a music festival. They are good videos and have been well received but if I wanted to make more videos from the same topic I could drill down into the discussion and dedicate more time to each part. From a top 10 tips video I could make 10 smaller videos giving each tip more explanation for example how to pitch a tent, what food do you need, festival recipes, best things to pack for a festival, how to survive the good/bad festival weather. All of those videos have merit in their own right and could easily be made into videos people want to see as well as the top 10 video compilation..